Letting snow pile up on your roof can lead to ice dams, leaks, and other costly repairs. Make this easy avalanche roof rake for the winter, and let a clever DIY design do all the work for you. When the snow started to pile up on handyman Bill Bachand’s roof, he did what any responsible homeowner would do: run to the nearest hardware store to find just the right tool before the pileup could cause any damage. Unfortunately, the rest of the town did the exact same thing, so by the time he got there, the seasonal section was emptied of every last roof rake. Instead of scouring all the stores in the area, he set off to make his own roof rake out of a handful of dependable, readily available hardware store staples—a resourceful move that saved him more than $100. 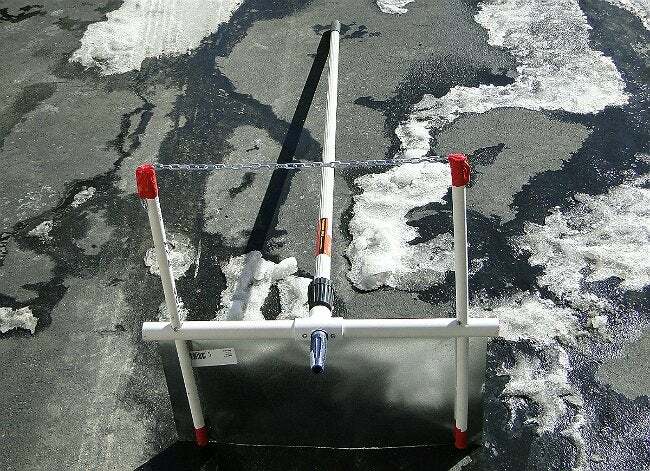 The inspired DIYer’s roof rake design capitalized on the durability and versatility of PVC pipe by using it for the snow tool’s H-shaped frame. One half of the frame holds a 12-inch-tall piece of sheet metal, which is attached to the frame by multiple screws. 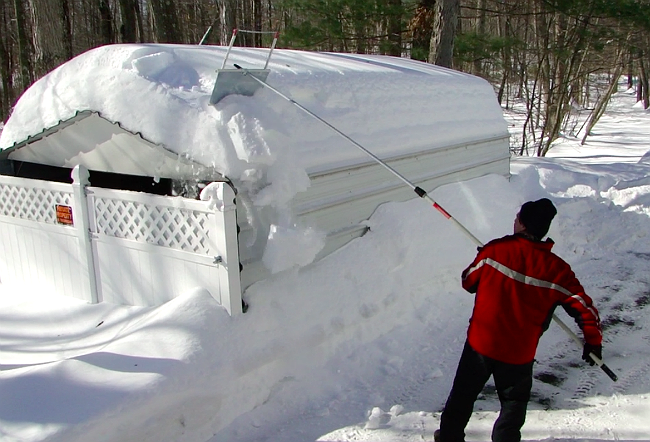 This large, flat metal surface does the heavy lifting, easily clearing snow piled up on the roof. Plus, when tapped against the roof, this portion of the tool speeds up the chore by knocking heavy snow and ice loose from the shingles. The other half of the frame holds a length of metal chain. On a sloped roof, this side of the rake lets you harness the effects of gravity: When you pull the length of chain along the shingles, the resulting “snowball” effect makes winter way less work. You’ve probably heard that you get what you pay for, be it a house or a handsaw. But when a budget build is paired with a genius design, that old rule just doesn’t apply. To see for yourself, give this $40 DIY a try! Your wallet—and your roof and your back—will thank you.